◎ Xi may be demonstrating that he is in control over the military by speaking at the Jan. 3 mobilization. 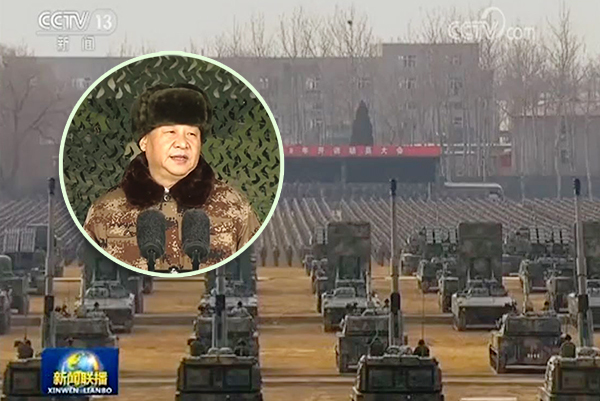 Xi Jinping addressed troops gathered for a mass mobilization drill at a military base in northern China on Jan. 3. All members of the Central Military Commission (CMC) and leading commanders of key departments were in attendance. The drill involved over 7,000 troops and nearly 300 tanks and other military vehicles. Other People’s Liberation Army (PLA) ground forces, navy, air force, and rocket force troops also held concurrent drills in over 4,000 locations across China. On July 15, 2017, Politburo member and Chongqing Party secretary Sun Zhengcai was suddenly arrested and investigated for corruption. Sun and other purged officials were later accused of having plotted to “usurp the Party leadership” by China securities regulator chief Liu Shiyu during a 19th Congress meeting on Oct. 19. On July 30, Xi donned camouflage fatigues and reviewed a large-scale military parade in Zhurihe base in Inner Mongolia. This was the first time a military parade was held in such a format, and appeared to highlight the PLA’s combat readiness. Near the end of August, Chief of Joint Staff Fang Fenghui and Political Work Department director Zhang Yang were abruptly removed from their post. On Nov. 28, the Chinese authorities announced that Zhang Yang had “committed suicide to escape punishment.” According to the official statement, Zhang was involved with purged CMC vice chairs Guo Boxiong and Xu Caihou. 1. Xi Jinping wore military garb at the mass mobilization drill on Jan. 3. As in Zhurihe, Xi was likely seeking to project combat readiness with his clothing choice. 2. Xi may be demonstrating that he is in control over the military by speaking at the Jan. 3 mobilization, where more troops were gathered as compared to the Zhurihe parade last year. 3. Xi needs to continually show that he, the CMC chairman, is in charge of the military because he is unable to guarantee the loyalty of his senior commanders. While Xi may have installed generals whose promotions he accelerated to key positions after taking office in 2012, many of these generals rose up the ranks during the Jiang Zemin era when they needed to win favor with Jiang loyalists Guo Boxiong and Xu Caihou.